We’re now regularly socking away about $1400/month into our retirement accounts. Student loans are shrinking. Credit card debt is still growing. Slightly. Free cash versus credit card debt I’m at about the same spot I was in February, which is not great, but better than a growing balance. 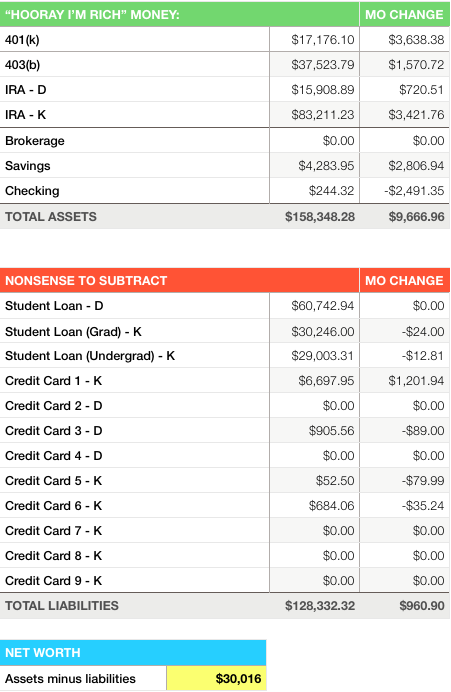 How can I be saving and growing debt? Simple. I mathed wrong. I paid myself first, based on a steady or shrinking monthly budget. I looked very closely at my 2015 and early 2016 historical spending and based my “pay myself first” on those figures. But, somehow, I messed up. It wasn’t quite right. I probably forgot about some 1x a year or lifetime budget blowing charges. Instead of holding steady or reducing my spending, I’ve been spending the same or more each month than I historically spent. So, boom. Budget blown. Credit cards keep a balance. My savings account keeps looking sad. I’m currently paying an incredible juggling game. I’m not paying any interest on my credit cards. I’m just assuming my future self will get spending under control before interest comes due. If interest does come due, my plan will likely be to pay a little interest by doing a balance transfer offer and kick the debt further into the future. That’s not a great plan. No interest is ideal. For this all not to blow up in my face, I’ve got to stop spending money! I think I’ve told myself this same thing for at least four months running now. Hopefully soon it’ll sink in and I’ll implement the spend no money plan.